Isn't that a beautiful swatch? It's a little brighter and redder than in real life, and the grooves between the stitches are much more pronounced in closeup than in real life. 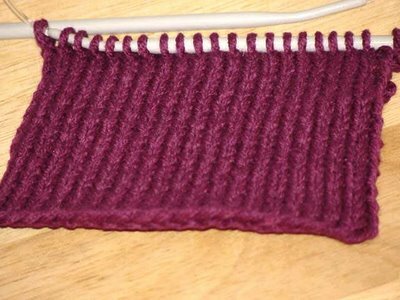 What you're looking at is a swatch of Rowan Calmer. 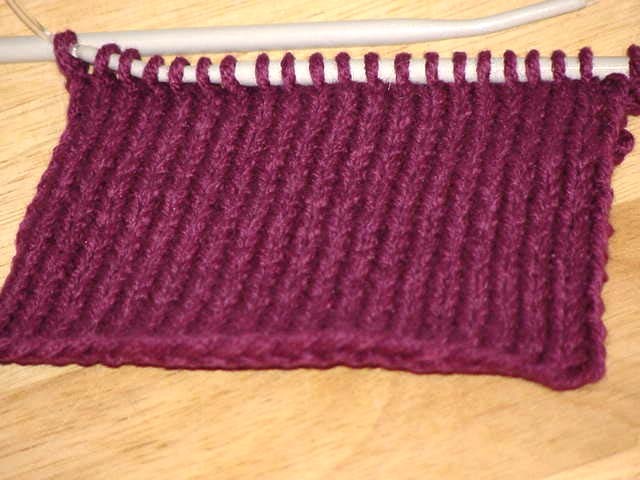 I'm excited about it because it's the beginning of a knit-along project I'm doing with Mary and Yam. We have to wait to get started, though, because Yam has to order the yarn and has some projects she needs to get off her needles first, then you'll hear all about it. On the food front, I'm one lucky knitting teacher. My Wednesday night student brought me a bag full of beautiful home-grown serrano peppers. 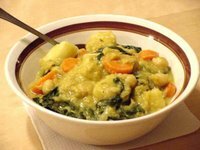 I see some salsa in my future, but in the meantime I used a couple of them in the Lentil Curry with Potatoes, Carrots, Spinach and Chickpeas I wrote about last February. I was thinking of writing about it again this weekend for this month's Spice Is Right event, hosted by Danielle of Habeas Brulee while Barbara of Tigers & Strawberries and her family spend time with their new baby. The theme was to write about a spice mixture that was an old family favorite and to make something with it. Since the most exotic spice in our house growing up was cinnamon, I was having trouble thinking of anything. 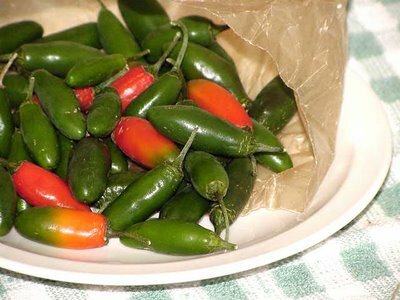 Until I thought of this recipe when Nicole gave me the serrano peppers, and I remembered the first time I made it. It calls for a number of spices--cumin, paprika, turmeric, ground cardamom and ground coriander. I had a couple of unsuccessful attempts at Indian food under my belt already, so I was apprehensive about how this would turn out. And it was delicious. The flavors all melded brilliantly, and the way all of the spices combined to make one intense flavor inspired me to keep cooking with more spice combinations, and eventually to toasting and grinding my own mixes. But things should settle down soon, and I hope to be posting regularly again. Hi Deb - it's me, Yam. Can't remember my blogger password. I guess it's been a while. ANyway, that is a beautiful color. I love Calmer, it feels like silk or cashmere or butter. Very swanky.